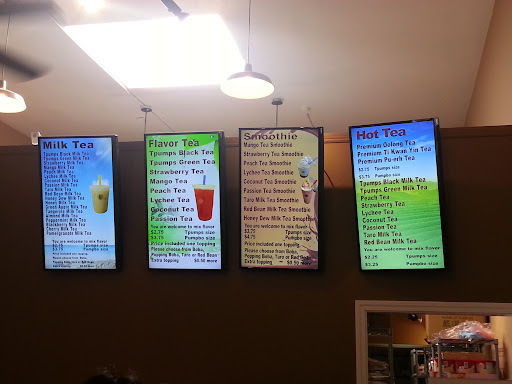 Thai snacks and desserts are made fresh at Bhan Kanom Thai. Plus they are open till midnight! Unfortunately, the Bay Area doesn't have anything close to this unless you count Sundays at the Thai Temples (see post HERE). I love all things coconut and Thai snacks do not disappoint with the coconut flavoring. The kanom krok are tiny glutenous mini spheres with a coconut pudding center. 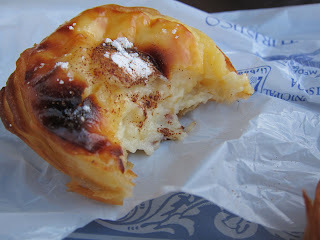 My favorite dessert of my sweet treat haul. 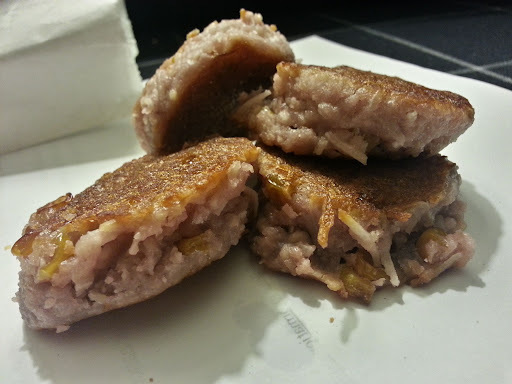 Pan chi aka taro cakes. These purple tinged mini cakes are made specially for coconut lovers. Made with shredded coconut, taro, and flecks of yellow corn, this sweet, chewy snack is griddle to create a thin crust, almost like mini latkes. 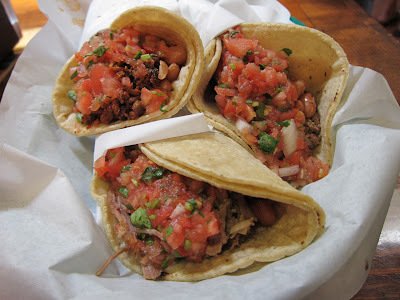 Kanom bueang look like mini tacos. They have a sweet flavor and a salty flavor. The sweet flavor has a persimmon center and the salty has a shrimp flavor. To me, it looks better than it tastes, but for a couple dollars its worth a taste. With my trip to Thailand last November still lingering in my mind, I was feening some good Thai food. 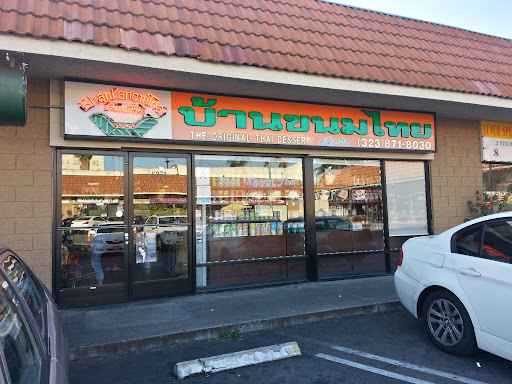 All my trips to LA and I've never explored Thai Town, which consumes a massive number of blocks in Hollywood. 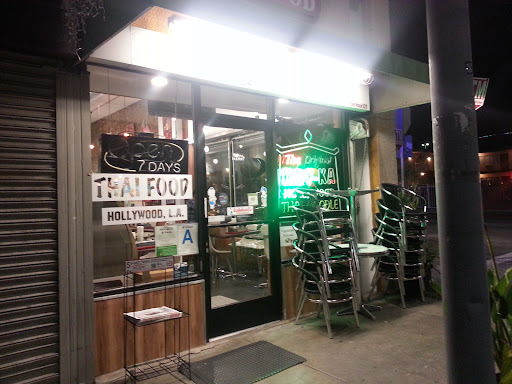 My original Thai restaurant choice of the night closed their doors on me 30 minutes before closing time so thank goodness The Original HoyKa Hollywood was close by. One thing that is lacking in Bay Area Thai food is the SPICYNESS! I'd heard from multiple sources that Thai food in LA does not mess around. Challenge accepted! The metal tin box that holds all the utensils reminded me of Thailand. Just in case of things were too spicy, I armed myself with Thai Ice Tea to soothe any extra spiciness. 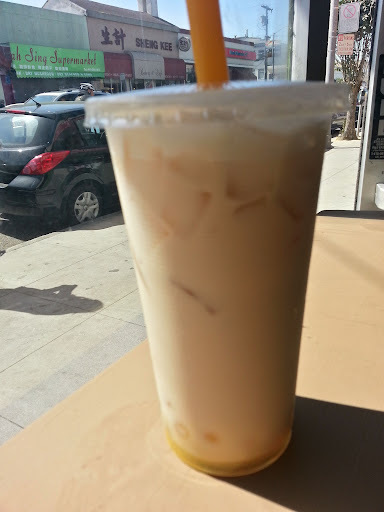 I rarely get Thai Ice Tea, but this one was sweet without being too sweet. Delicious. 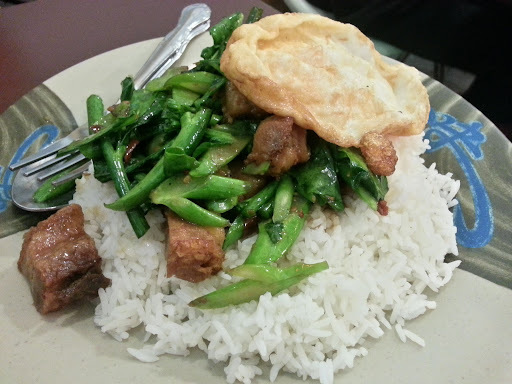 Crispy pork with Chinese broccoli over rice. I added an egg, which ended up not being runny enough for my taste. The pork was flavorful, but some pieces were a bit too tough. I've had better. All the dishes I ordered were medium spicy, but the spice level was a good "hot". Spicy enough to sting your mouth, but I could still enjoy the flavors of the food. Although I didn't use any tissues to blow my nose so maybe I venture another spicy level up next time. Still a lot spicier than most places that I order "Thai spicy". A lot of people seem to really like the namesake soup here - the HoyKa noodle soup. A choice of either chicken or pork, (in this case it was chicken), sliced chicken, and fishballs. The broth was lighter and delicate with a surprisingly, sweet flavor. I missed out on eating boat noodles in Thailand, but I've been seeking it out lately. The one thing that distinguishes it from any other Thai soup is the blood. The murky, almost irony color, in the broth is made from blood. A little funky, but definitely delicious. You don't really taste the blood, but you do notice that the soup has a slightly heavier when you are slurping it. Mixed with pork slices, fish balls, bean sprouts, and thin noodles, this soup is slurpworthy. Not only is the spice level pretty legit here, but the price is ridiculously cheap. A small bowl of soup is only $3.50. The corner that Langer's is on reminds me a lot of SF from the screaming bums to the guy who asked me if I need a fake ID. Even in a questionable area, people still lined up for a seat at this historical eating institution. 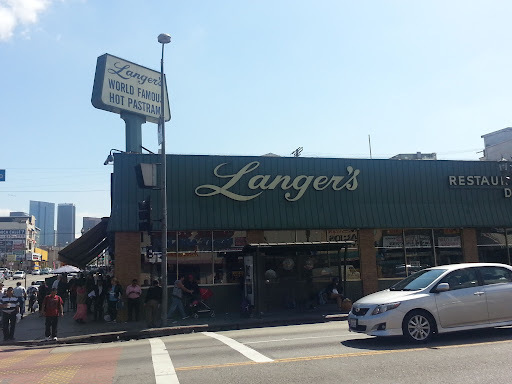 Served up with a pickle, the hot pastrami (#19) at Langer's is their most famous sandwich. Supposely, only Langer's and Katz are the only two delis in America to serve hand cut pastrami slices in their sandwiches. Had I known that I could order half sandwiches, I would have ordered their corned beef sandwich, which many consider even better than their pastrami. 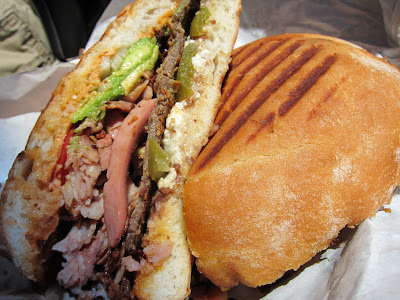 This sandwich has to be one of the best sandwiches I've ever had in my life. I've had Katz's version and while I think its a good sandwich, I prefer Langer's. Everything about this sandwich is pure perfection. 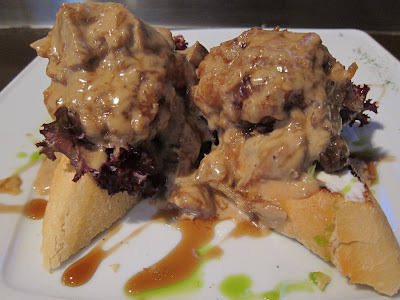 Succulent and savory meat that doesn't have the usual over saltiness that I find in most pastramis. The crunchy coleslaw has the lightest touch of mayo and offers the perfect contrast to the soft bread. Besides how awesome the pastrami is, the bread is just amazing. The freshly baked bread is nutty and fluffy with just the right amount of thickness. 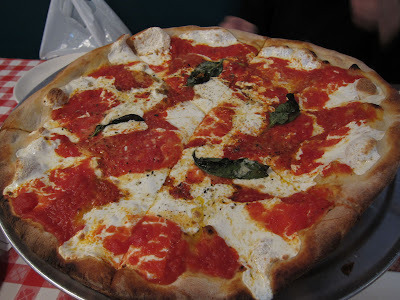 Usually crust is an afterthought for me, but, wow, the crust has a crisp, but soft texture that's indescribably delicious. 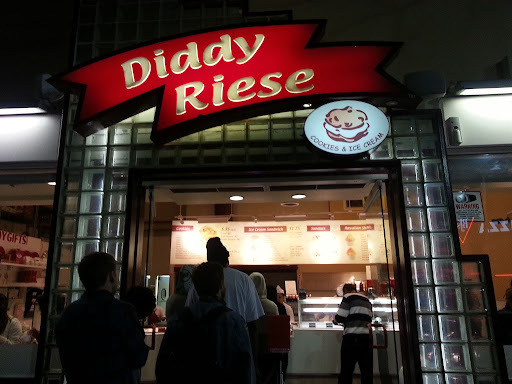 Diddy Riese is LA's version of the Bay Area's CREAM (see post HERE). 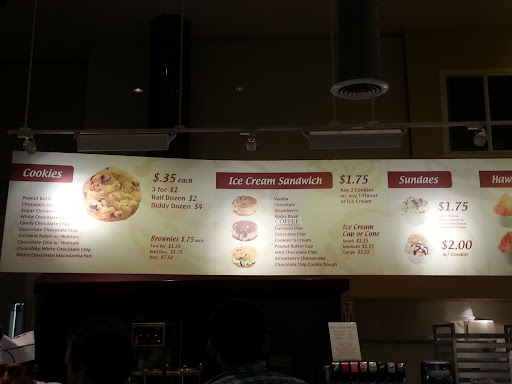 The $1.75 ice cream sandwich is a UCLA favorite and there is a consistent line out the door even at midnight. Diddy Riese has other sweet options like sundaes and Hawaiian shaved ice, but majority of the orders are for the ice cream sandwiches. The ice cream sandwich cookie choices are: choc chip w/walnuts, white choc macadamia nut, peanut butter, double chocolate chip,white chocolate chip, oatmeal raisin nut, chocolate w/white choc, sugar cinnamon, candy, chocolate chip. After choosing a combination of two freshly baked cookies, then you have a choice of Dreyers ice cream flavors: vanilla bean, cookie dough, rocky road, mint chocolate chip, strawberry, chocolate, espresso chip, butter pecan, strawberry cheesecake chunk, peanut butter cup, chocolate chip, cookies & cream. 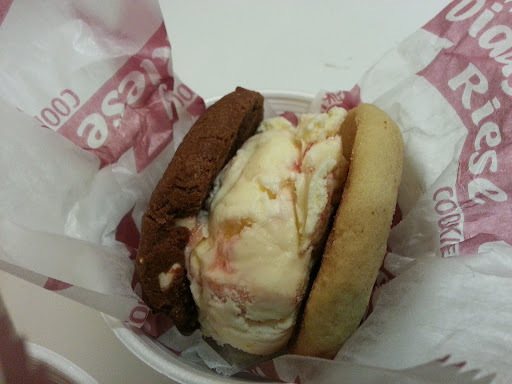 The warm cookies at CREAM made for a messy ice cream sandwich, but at Diddy Riese each sandwich is neatly placed in a cup for easy eating. Even though my inner go green mentality knew these cups were wasteful, I really liked eating my ice cream cookie like that. It gave me the option to either scoop up the ice cream with a spoon or bite into it when I felt like it. Mint chocolate chip ice cream sandwich with double chocolate chip cookie and chocolate chip with walnuts. CREAM has better flavors, but the ice cream quality and taste is lacking. 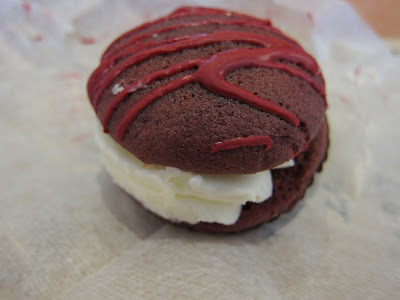 Since Diddy Riese uses Dreyer's ice cream, the ice cream sandwiches taste better than CREAM. 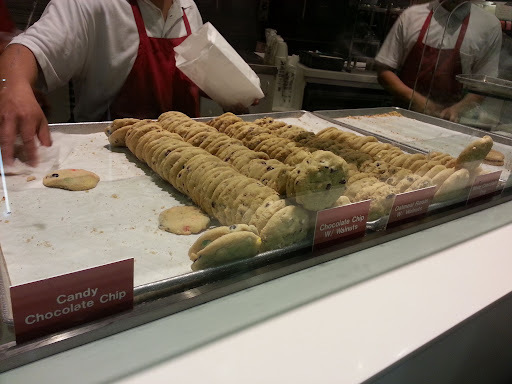 The cookies are nothing special, but the $1.75 price tag makes it a popular treat. Ice cream sandwich with strawberry cheesecake ice cream and snickerdoodle and double chocolate chip cookies. The cookies are soft, but lacking any real flavor. Overall, they are a decent snack if you are in the area. My dream ice cream sandwich is probably Anthony's Cookies (see post HERE) with some Bi-Rite ice cream (see post HERE), which would probably cost upwards of $7. A girl can wish, can't she? 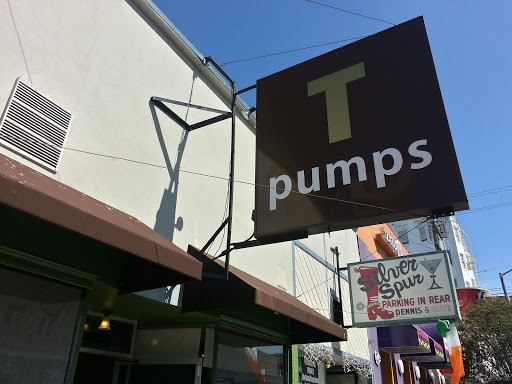 This LA trip I promised myself I check out LA's budding coffee scene. 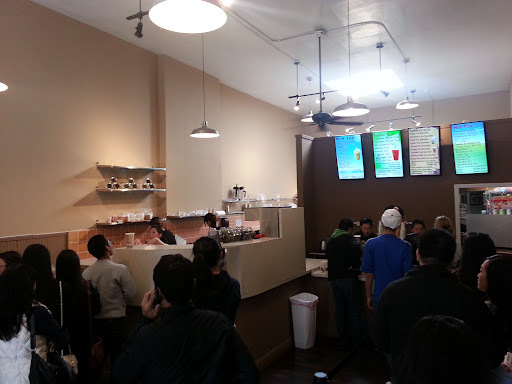 I'm no stranger to lining up for a good cup of coffee (Ritual, Blue Bottle), but the line and wait for a cup of coffee here topped even that. A good 5-10 minute circle to look for parking, which didn't exist. The only option was a valet parking around the corner. So a 10 minute parking search plus another 20 minute wait in line to get to the register, and another 10 minutes wait for my coffee to actually be made. I paid the most I ever thought I would ever pay for a cup of coffee - $5. Limu Union, Ethiopia with flavors described as kiwi, chocolate covered cherry, and lime spritzer. I'm not sure if I tasted any of the flavors in my coffee, but it was some of the smoothest, tastiest coffee I've ever had. As a Blue Bottle and Four Barrel coffee lover, I almost hate to admit this coffee might be better than SF coffee. 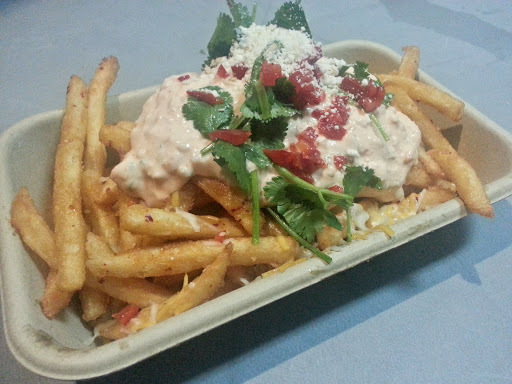 I'm a little ashamed to say I've never had Roy Choi's ever so famous Kogi truck. Since his rise to stardom, he's created a couple other restaurant/food truck that are scattered all over Los Angeles. Going with the same Mexican-Korean fusion theme, Roy Choi created Chego. Chego started off as a restaurant, but they seem to be having some issues for quite a while now and have set up shop in a food truck right outside the parking lot of the restaurant. I couldn't decide between the Chubby Pork Belly Bowl or the Beef T bowl. Pork belly or hot chili fried rice with prime rib? Pork belly won over. It isn't soft and scrumptious like most pork belly. 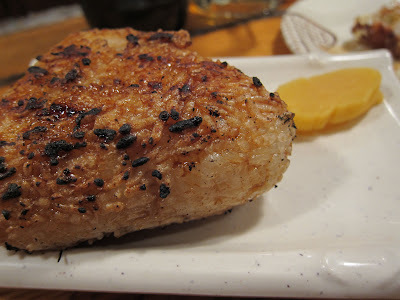 It has a meatier texture that I wouldn't categorize as a pork belly characteristic. The kochujang coated kurobuta pork was still yummy. Again, the topping just amazes me. A mix of pickled radishes, water spinach, Chinese broccoli, cotija and peanuts makes for a different flavor in each bite. The fried egg doesn't hurt either. The ooey gooey fries are beer battered and extra crispy. They are topped with a mix of sour cream sambal, monterey jack, cheddar cheese, cotija, chilies, cilantro, and pickled garlic. Not exactly Korean, but not really Mexican either. It's not your ordinary nacho topping. 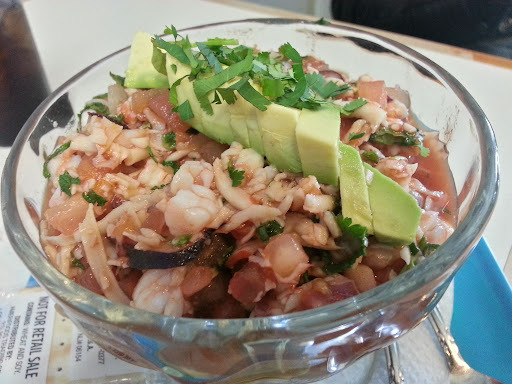 The explosion of Mexican and spicy flavors was a fusion combination, I've never tasted before. 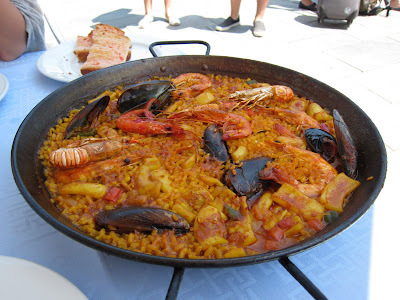 Delicious and messy, its one of those dishes you just want to get dirty with. I had high hopes for dessert with the Sriracha bar. A firmer rice crispy treat with caramel and spiced candied peanuts wrapped in a Sriracha ganache. Besides that I couldn't taste the Sriracha flavor at all, the bar itself was too hard to enjoy. I was over it pretty quickly after the disappointing first bite and discovering there was zero Srirarcha flavor. Today was one of those days when you just feel like a sandwich. 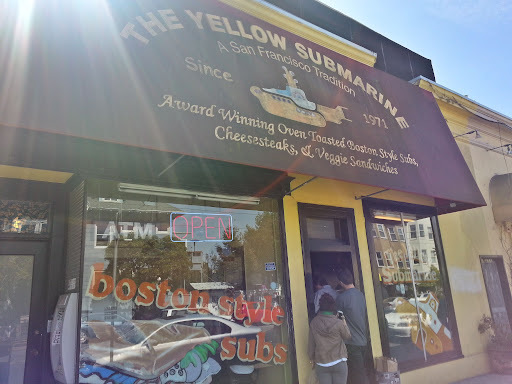 I always walk by this sandwich spot and swear to myself I will remember to check out their sandwiches one day, but never remember (okay, I have a lot of those). The potato salad had the perfect amount of mayo, which is not a lot, but just enough to get all the potato chunks to stick together. The sandwiches are ginormous. Almost as large as Ike's, so the smallest size (medium) is good enough for two people to share. Steak and cheese sandwich is one of the more popular sandwiches here. Thinly sliced beef with your choice of cheese (American, swiss, or provolone), (I chose American), along with everything (Mayonnaise, Mustard, Tomato, Lettuce, Pickles, Oil, Vinegar, Hot Sauce). Everyone seems to rave about their house made hot sauce, but I couldn't really taste it so I'm not sure if they forgot to put it on mine or I should ask for extra next time. 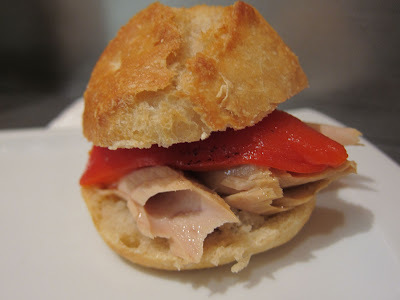 The sandwich was pretty delicious, even though I didn't taste any hot sauce. The only thing is the cheese got lost in the meat so next time I would ask for extra cheese. Another popular sandwich here is the hot pastrami. Usually I find that hot pastrami is a little too salty for my taste, but the thin, chopped up pieces of meat were more flavorful than salty. Not the best pastrami I've had, but not bad either. Sidenote - While waiting for my order, I noticed that on the menu avocado is listed under sandwiches. I debated if that meant avocado with (insert a meat here). Apparently, it meant an avocado sandwich! How awesome! Let's face it, the only reason why anyone gets any sandwich that has avocado in it is purely for the avocado. The Yellow Submarine eliminates all the other stuff! Will be back for that one. 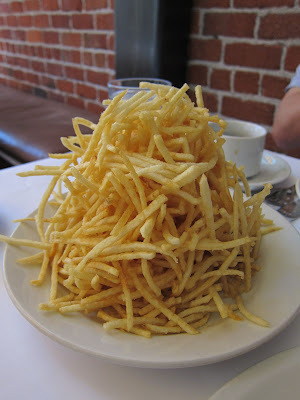 The fries are cut in thin slices, like potato chips, but not as thin. Crispy on the edges, but a soft middle so you can taste the potato goodness. It took me two tries to make it to FuseBox. 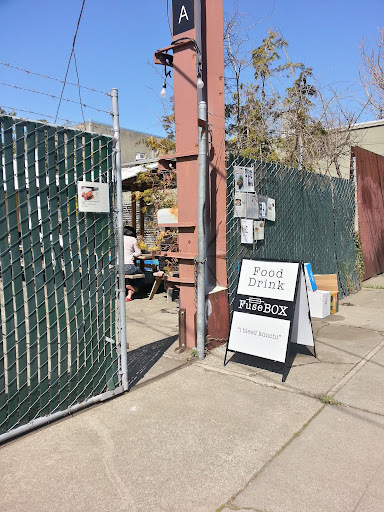 After finally announcing that they are open on Saturdays for lunch, the first attempt at eating here happened to be one of the days FuseBox was closed for the owner's daughter's soccer game. FuseBox's KFC are so delicious. They don't look like much, but they have a light crisp crust that surrounds the moist, juicy chicken. The sauce is slighly spicy, but not too much. The best item here. From top left; clockwise: pickled shittake mushrooms, pickled daikon, pickled kale, kimchee bok choy, spicy cucumbers, and kimchee cabbage. The panchan here varies. I looked over and noticed that other diners had a different variety of panchan. Besides my usual favorite of cucumber kimchee, I really liked the bok choy kim chee. The bap with pork belly came with rice and the skewer of peas. The pork belly was a little dry. The bap came with pea skewers. 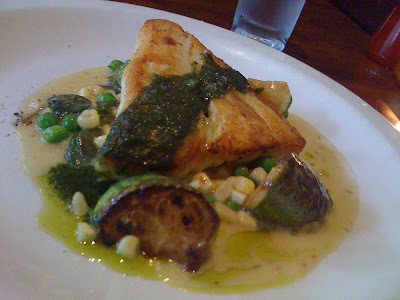 A little too oily, but the peas were fresh and tasty. I had high hopes for the Tokyo Po'Boy. I'm not sure what type of bread they use, but it was too chewy and didn't taste fresh. After being very impressed by their KFC, I was surprised that the fried chicken in the sandwich was soggy and flavorless. The sweetness of the slaw overpowered the whole sandwich. Freshly fried beignets with a side of ginger flavored cream for dipping. The beignets were tasty, but they were denser and chewier than real beignets. Normally, I stay away from anything ginger flavored, but the ginger flavored cream had the perfect touch of ginger flavoring. 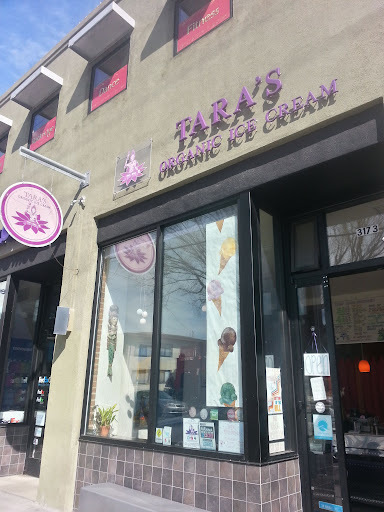 Tara's Organic Ice Cream reminds me of SF's Humphrey Slocombe (see post HERE). 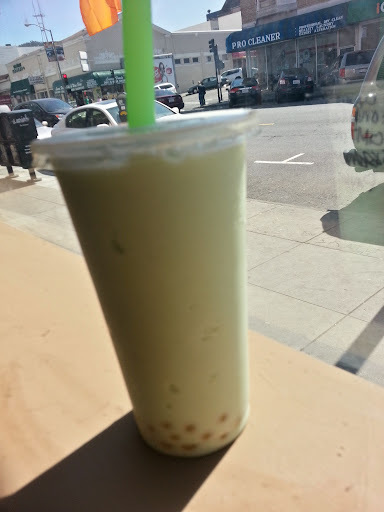 They have a collection of funky flavors like Buttermilk and Yerba Mate. An Earl Grey scoop on top of black sesame in a cup. The Earl Grey flavor is subtle with a hint of sweetness. Since the black sesame ice cream doesn't have as strong of a flavor as Polly Anne's, I actually liked Tara's version. Mint chocolate chip on top of chocolate hazelnut in a cone. Mint chocolate chip is minty, not like artificial mint, more like straight out of the garden mint sprigs. The chocolate hazelnuts is smooth and creamy. Super chocolatey swirled with hazelnut flavor.